Despite Dömötör Gyimesi’s assertion that his homeland is not a hotbed of progressive metal – “we have some strong names here in Hungary who have been around for some time now, mainly mainstream and pop/metal bands apart from a few refreshing exceptions, but unfortunately progressive rock/metal is simply just not for Hungary,” he notes – the guitarist/vocalist has every reason to be pleased with himself and his band. 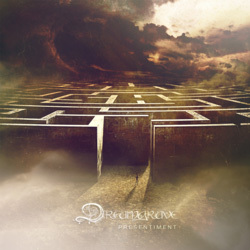 Dreamgrave, which he formed in 2007, have just released their debut album ‘Presentiment’; a progressive metal fan’s dream, ‘Presentiment’ is as exciting as they come, twisting light and shade and juggling time and mood changes a-plenty, and it’s hard to believe that this is the band’s first full-length outing when many acts struggle all their lives to come up with something as innovative and electrifying. And who am I to disagree? ‘Presentiment’ is both dark and exhilarating, swaying between the abject brutality of Machine Head style riffing (check out ‘Black Spiral’) and the sublime beauty of the likes of ‘Memento Mori’. And in ‘It’s Ubiquitous’ the band have fashioned a slow-burner of ethereal magnificence, cut from the Anathema cloth but handwoven in a quite non-ubiquitous fashion. Across the album the clean and dirty vocals from Gyimesi and the beautiful voice of Mária Molnár are used to great effect, and with the keyboards also taking a lead role at times, rather than just producing a background soundscape, Dreamgrave have a full arsenal of explosive talent to draw on.